The International Art Museum of America opened its doors on October, 15th, 2011. This institution showcases works made by the alleged reincarnation of the primordial sambhogakaya Buddha. Earlier this week, Artist Andy Gouveia and I paid the museum a visit and stepped into the world of H.H. Dorje Chang Buddha III. 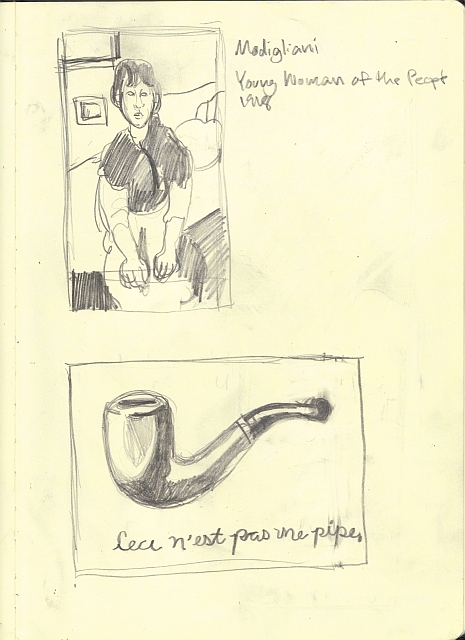 I only came up with a couple of drawings and some verbatim notes of description labels. 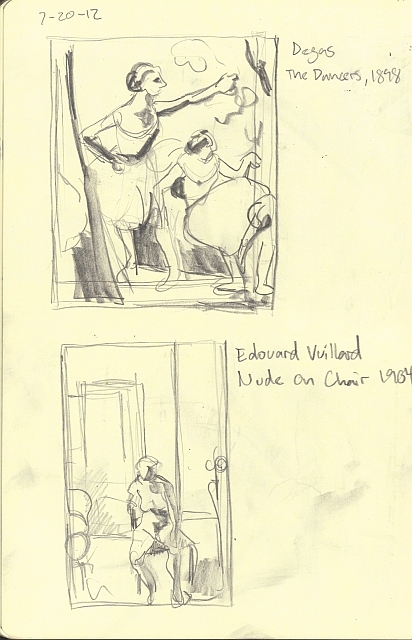 There were odd curatorial choices that made it hard to observe and understand some of the pieces. The interior also looked like Tony Montana’s house so the lavishness was distracting at times. One thing is certain, the IAMA is unlike any other art museum in San Francisco. Bust of H.H. Dorje Chang Buddha III. Andy observed that the text by this piece “smacks down other Buddhas”, stating that they are only self-conferred reincarnations. The label told us that Chang Buddha III was tested and approved by a number of Tibetan Buddhist sects. 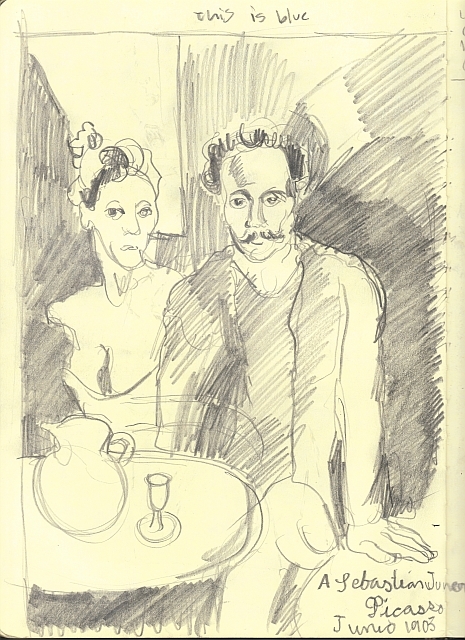 The museum celebrates the work of H.H. Dorje Chang Buddha III but there were very few of his original paintings on display. Most of the artist’s two-dimensional works were scans or photo reproductions printed on traditional hanging scrolls. Andy and I even saw pixelation in some of pieces. All the paintings were hung within glass display cases. We spent a lot of time getting close to the pieces — fogging the glass up with or breath — asking each other “is this one real?” Many of the reproductions had areas of opaque paint or textured varnish brushed on top to make them more unique. There were a number of original, western style paintings (primarily from the 19th century) on display. Unlike the Buddha pieces, the European paintings had descriptive labels with dates and the artist’s country of origin. These works did not have their own section; they were hung next to more H.H Dorje Chang Buddha III paintings. To show his admiration of western art, the Buddha made two paintings based on works by Claude Monet and Vincent van Gogh. These works combined oil paint and what looked like spray foam to achieve three-dimensional effects. It was described as the “Thickly Piled Patches of Color” style. H.H. 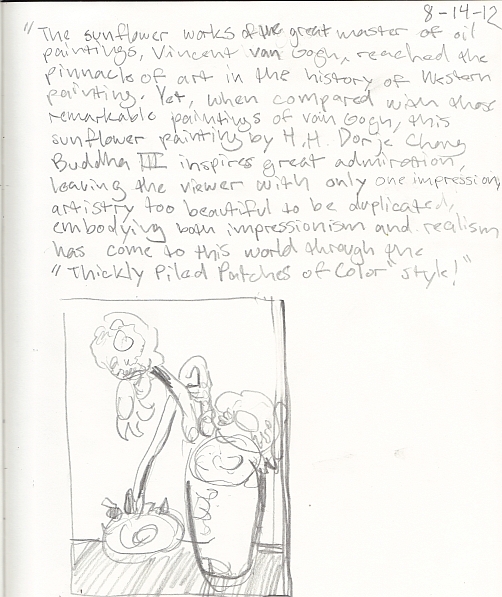 Dorje Chang Buddha III is inspired by van Gogh, paints a picture, then the Dutch artist is dismissed. The sculptural works on display were interesting and fun to look at. On the IAMA website, the sculptures are described as faux boulders. Cavernous worlds exist within these egg-like objects. Andy and I guessed that they were most likely made from the foam spray seen in some of the Buddha’s other paintings and decorative frames. Each piece sat upon rippling silky fabric, fully enclosed in glass. Andy commented that if the sculptures were placed on plain white pedestals with no enclosure, they would resemble something seen at YBCA or some other contemporary gallery. “Yun” art is still a mystery to me. I wasn’t able to find any information on the Yun process or the materials involved. There is no doubt that H.H. 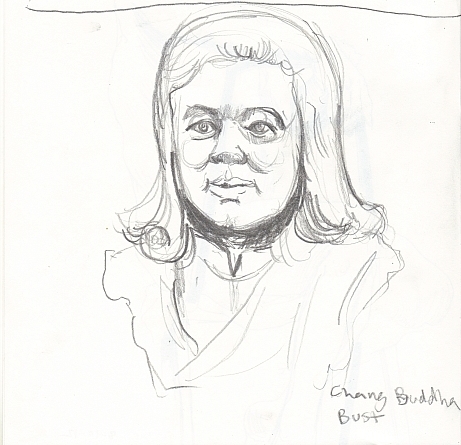 Dorje Chang Buddha III is a prolific artist. However, the International Art Museum of America collection showed us the work of a dabbler. There were many beautiful works on display but the word “mastery” did not come to mind when viewing them. The quality of Buddha’s calligraphy was questionable and the extravagantly ornate paintings (and exhibition space) seemed contradictory to Buddhist ideals. Andy and I left the museum with more questions than before. I still feel ignorant of Tibetan Buddhist doctrines and H.H. Dorje Chang Buddha III is more enigmatic than ever. If you have read this far or have recently visited the IAMA please share your thoughts. 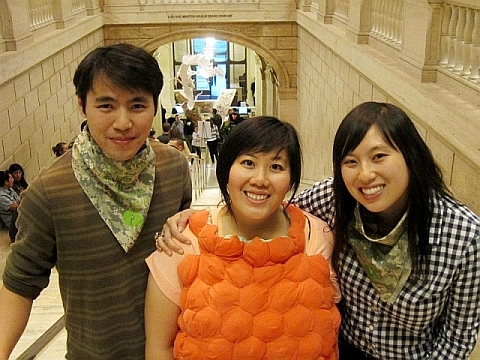 Matcha: Taking Up Space at the Asian Art Museum was a complete success! On Thursday, July 26th, 2012, 730 guests showed up to participate in the final Space Bi project. The turnout proved that you don’t have to be a celebrity chef or Balinese guitar virtuoso to draw a crowd. Local emerging artists have an audience too! It was great to see so much active talent and creativity under one roof! Reunited! Me, Imin Yeh, and Jennifer Yin on top of the steps in Samsung Hall. Not too long ago, we all worked at the Asian Art Museum together. On June, 23rd, Imin Yeh and I had a casual G-chat session about what I would be contributing to the event. 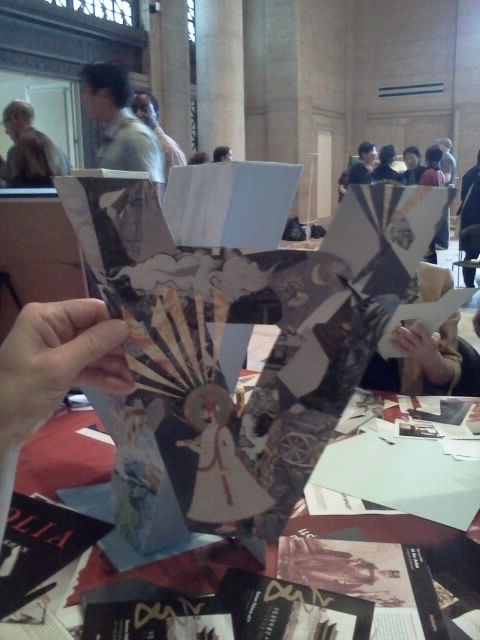 She suggested that I make a new collage piece using the new Asian Art Museum logo as the format. 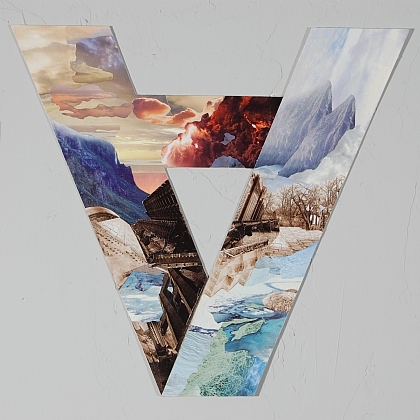 My ongoing series of fantastical landscape collages are tied to the Asian Art Museum in many ways, so this particular body of work was the most appropriate for the Matcha project (see earlier post “Fractured Skies”). “Quantifier”. The original pieces is roughly 14″x15″. The piece took about two weeks to complete. Like my previous collages, I used cut photographs of Korean palaces to build the structures within my landscape. 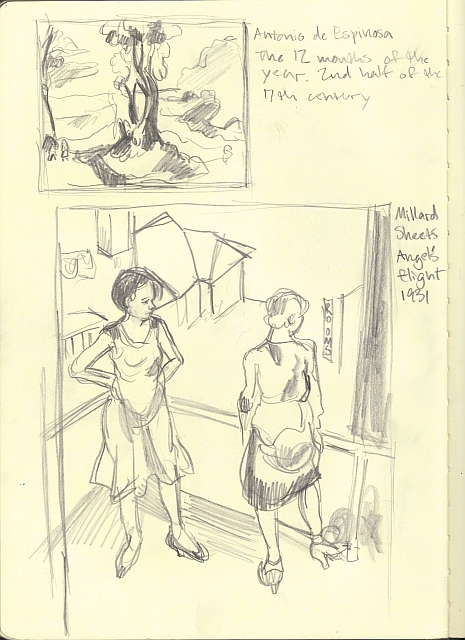 I also drew inspiration from narrative Japanese screens and Chinese landscape paintings. The vertical formats and unique perspectives that I saw in traditional painted works informed some of my artistic decisions. It was important that my work matched the Space Bi mission statement as well as the themes of the current “Phantoms of Asia” exhibit. So what’s the significance of the shape of this piece? 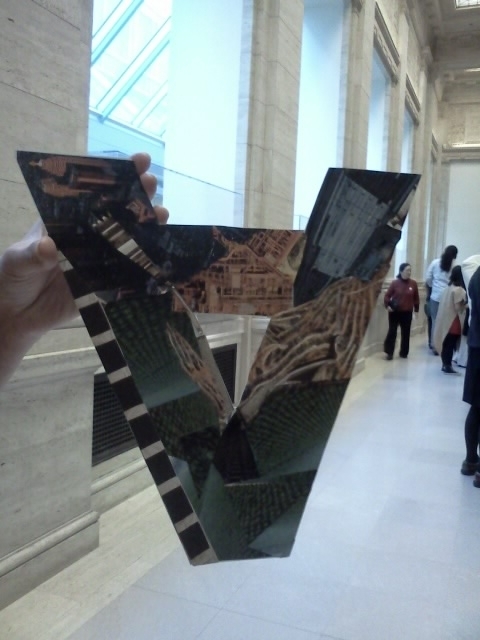 When I was still an employee at Asian Art Museum my boss explained the logo concept to me. I was impressed by meaning behind the new brand. The universal quantifier (∀) is often informally read as “for all”. This was a loaded symbol which to me represented renewed relevance and inclusiveness. Marc Mayer, educator for public programs, told me that the boldness of the new logo was one of the reasons he was interested in working at the Asian Art Museum. 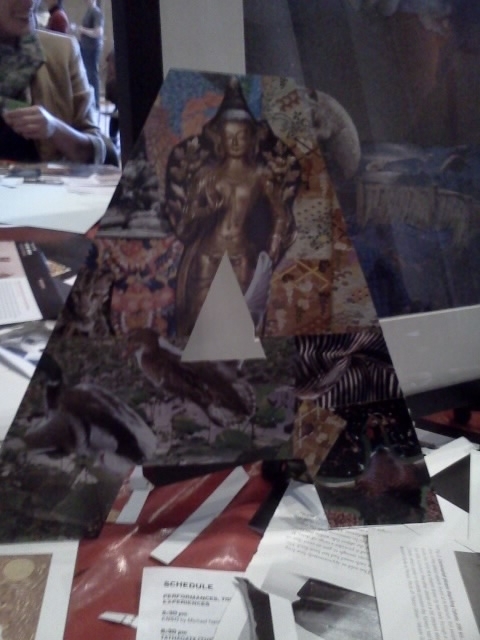 Our original idea was to enlarge the finished collage and paste it on the 7-foot “A” sculpture behind the admissions desk. Marc took care of the logistics of this undertaking. The costs of vinyl printing and installation were extravagant and I was honored that the museum even considered investing in the project. 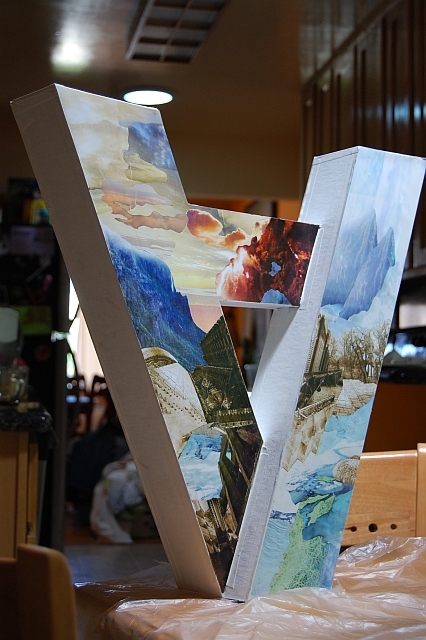 Ultimately, my artwork was not on brand and could not be used to cover the sculpture. The museum often uses imagery within the logo but the right diagonal bar of the quantifier is ALWAYS blank. I got this news on July, 17th, nine days before the event. So on top of coordinating 28 artists, handling all the PR for the event and screen printing bandanas and gift bags for guests and artists, Imin built a miniature version of the “A” sculpture! On July 23rd, she handed it over to me and I finished it with enlarged prints from Office Max and some acrylic paint. On the evening of the event, I hosted a drop-in collage workshop where visitors could make their own version of the logo. Many thanks to the staff and volunteers that helped out at the table that night. Everybody made beautiful work and nobody was on brand. Friday, July 20th, 2012. 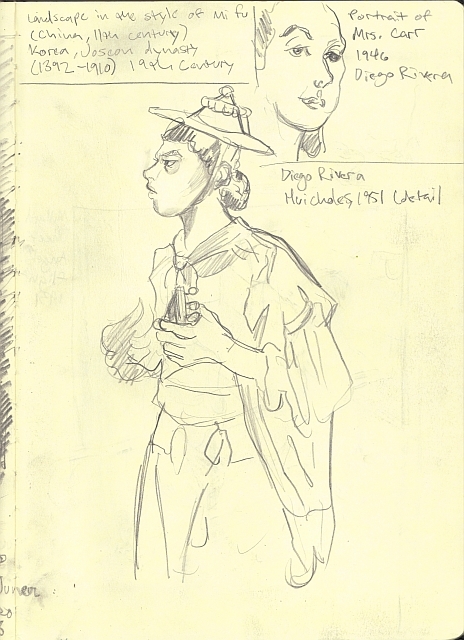 Drawings from the LACMA permanent collection. Saturday, July 21st, 2012. 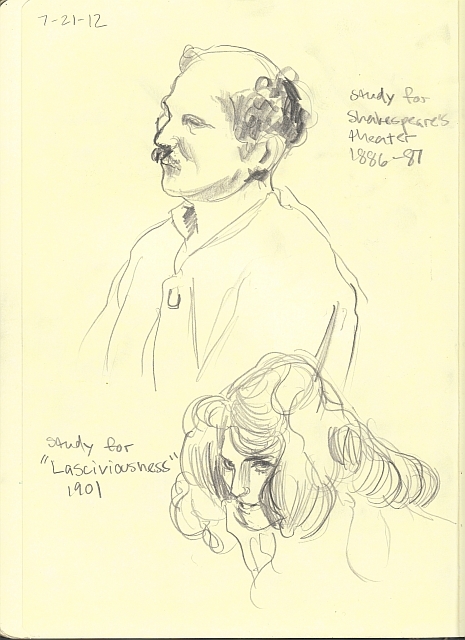 Drawings from Gustav Klimt: The Magic of Line at The Getty Museum.